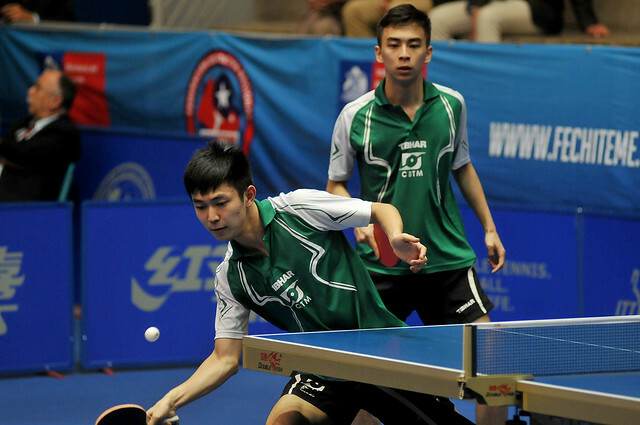 Winners just over one year ago in Cartagena de Indias, the top seeds; on the morning of Tuesday 20th November, in their opening fixture in the first stage of the Men’s Team event at the Sparta 2018 ITTF Pan American Championships in Santiago, Chile, Brazil came crashing down to earth. A three matches to one defeat was experienced at the hands of the United States, the no.9 seeds. There was no inkling of the upset that was to accrue, as the Brazilians made the ideal start; Vitor Ishiy and Thiago Monteiro accounted for Nikhil Kumar and Nicholas Tio in four games (8-11, 12-10, 11-6, 11-9). However, that was to be the only success for the South Americans. Kanak Jha levelled matters by overcoming Eric Jouti in five games (11-6, 11-7, 8-11, 6-11, 11-1), before Nikhil Kumar prevailed against Vitor Ishiy in four games (4-11, 12-10, 11-8, 17-15). The United States ahead, returning to the action, full of confidence after his earlier success, Kanak Jha accounted for Thiago Monteiro in three straight games to seal the victory (11-8, 11-6, 11-7). Kanak Jha, the hero of the hour for the United States, for Puerto Rico, the no.4 seeds, that role was fulfilled by Brian Afanador. He remained unbeaten in a three-two success in opposition to Canada’s Jeremy Hazin, Marko Medjugorac and Eugene Wang, the no.11 seeds. Crucially, after Daniel Gonzalez and Yomar Gonzalez had beaten Jeremy Hazin and Marko Medjugorac (11-9, 11-9, 6-11, 11-3) to secure the doubles, he accounted for Eugene Wang by the very narrowest of margins (9-11, 11-4, 5-11, 11-8, 11-9). Later, with matters level, he returned to the fray to beat Marko Medjugorac in the vital fifth match of the fixture (11-9, 10-12, 18-16, 11-7). Tension packed contests, for Chile, the no.2 seeds and Argentina, the no.3 seeds, life was less hectic. Represented by Gaston Alto, Horacio Cifuentes and Nicolas Galvano, a three-nil win was recorded against, the no.12 seeds, Ecuador’s Alberto Miño, Emiliano Riofrio and Pablo Vanegas. Imposing from Argentina, selecting Gustavo Gomez, Juan Lamadrid and Felipe Olivares, it was very much the same from the host nation, when facing Guatemala’s Hector Gatica, Allan Gutierrez and Kevin Montufar, the no.10 seeds; a three-one win was posted. The one winner for Guatemala was Allan Gutierrez, in the second match of the engagement, he accounted for Felipe Olivares (13-11, 11-6, 2-11, 11-4). The second series of fixtures in the opening stage of the Men’s Team event will be played later in the day; outfits finishing in first and second places in each group advance to the main draw.